Many people think that a coconut custard pie is the same thing as a coconut cream pie, but that's not exactly true. Yes, they both have a custard filling, which is basically a mixture of milk, eggs, sugar, vanilla, and salt, but the difference is in the cooking. The custard pie is an uncooked filling poured into an uncooked crust, and both are cooked together. A cream pie, however, is a cooked and cooled filling poured into a precooked and cooled crust, usually with a layer of whipped cream on top. So, there you have it. Did that make sense? This is a simple coconut custard pie that uses all the basic custard ingredients and is a snap to throw together. It's perfect for any occasion or holiday dessert. And can I just tell you how heavenly it smells while it's baking? I'm not even kidding! Place pie crust in a 9" pie plate. Flute to make a decorative edge. Set aside. In a small sauce pan, scald milk over medium heat. In the meantime, prepare the other ingredients. In a mixing bowl, beat eggs. Stir in sugar, salt and vanilla and coconut extracts. Gradually add scalded milk while stirring constantly. Stir in coconut and a little sprinkle of cinnamon. Pour into prepared unbaked pie shell. Bake for 25 to 30 minutes until lightly golden on top or until an inserted knife comes out clean. Cool completely, then place in the fridge to chill. 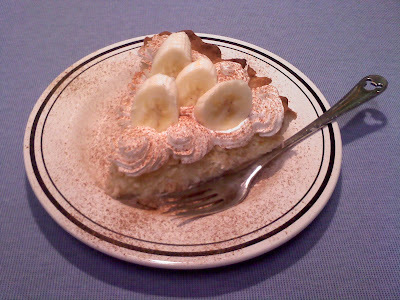 Serve with a dollop of whipped cream and a few banana slices. You really don't need to add the cinnamon or the coconut extract, but I always do. I just think they make it taste better! You can use a store bought ready made pie crust, or just use half the recipe for my Easy Pie Crust.